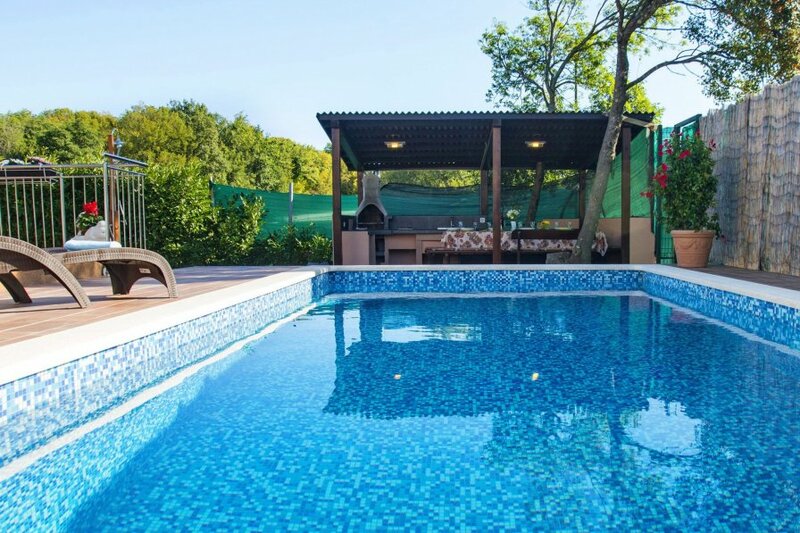 This 6-bedroom villa for up to 12 guests is located in Labin and has a private swimming pool. Strmac 3 km from Labin: Beautiful semi-detached house Dora, 2 storeys. 7 km from the centre of Rabac, in a quiet, sunny position, 7 km from the sea. Private: property 700 m2 (fenced), swimming pool angular (8 x 3 m, depth 140 cm, 04.05.-28.09.) with internal staircase. Outdoor shower, terrace (20 m2), garden furniture, barbecue (slide, swing). In the house: internet access, trampoline, washing machine. Parking (for 6 cars) at the house on the premises. Shop 200 m, supermarket 100 m, restaurant 200 m, pebble beach 7 km, rocky beach 7 km. Tennis 7 km, walking paths from the house 100 m, cycle lane 150 m. Please note: suitable for families. The unit consists of 3 houses rented as one unit. Youth groups are not allowed. 9-room semi-detached house 225 m2 on 2 levels. Living/dining room with kitchen corner, satellite TV and air conditioning. Exit to the terrace. Living/dining room with kitchen corner and air conditioning. Exit to the terrace. Living/dining room with air conditioning. Exit to the terrace. Open kitchen (oven, 4 ceramic glass hob hotplates, microwave, freezer, electric coffee machine). 3 sep. WC's. Upper floor: entrance hall with air conditioning. 1 room with 2 beds (90 cm, length 200 cm). Exit to the terrace. 1 room with 2 beds (90 cm, length 200 cm). Entrance hall with air conditioning. 1 room with 2 beds (90 cm, length 200 cm). Exit to the terrace. 1 room with 2 beds (90 cm, length 200 cm). Entrance hall with air conditioning. 1 room with 2 beds (90 cm, length 200 cm). Exit to the terrace. 1 room with 2 beds (90 cm, length 200 cm). 3 showers/WC. 3 terraces 20 m2, 3 terraces 5 m2. Terrace furniture, deck chairs. Facilities: Internet (WiFi, free). Each house with living/dining area, open kitchen on the ground floor and 2 bedrooms on the first floor.